FINANCIAL DISTRICT — This bin does more than just recycle. 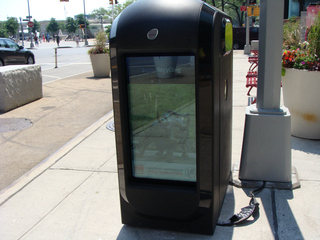 A sleek new paper-recycling bin that can also display news and emergency notifications landed in Lower Manhattan earlier this month. The black oblong Renew Recycling Pod at Water and Whitehall streets is shorter and wider than the domed green and blue ones the city typically uses, and it has two large screens that can be programmed to scroll headlines or other messages. The Downtown Alliance business improvement district launched the pilot bin with J.M. Ornstein and Media Metrica, which conceived the design and has installed 50 of the bins in London’s financial district. The bins cost tens of thousands of dollars apiece to produce, but Media Metrica offers them to cities for free and then makes money on the content the bins display, Timpone said. The pilot Renew Recycling Pod is the first to be installed in the United States, Timpone said. He hopes to add more Downtown, perhaps in privately owned public spaces like Zuccotti Park. The pods also come in a version that recycles bottles and cans. Because the pilot bin is located on a Department of Transportation plaza, zoning rules prohibited the Downtown Alliance from running headlines on the two display screens, which instead show a fixed map of Lower Manhattan and a photo of the neighborhood, Timpone said. If the pods are installed in other spaces not run by the DOT, they will be able to display headlines and other information, Timpone said. So far, the pilot bin has met with a positive reception Downtown and is filling up at least as quickly as a traditional recycling bin, Timpone said.